Be careful what you say; you can’t take those words back. If you say it, you mean it. I don’t mean that words said in anger are the ones that people live by at all times. Still, when angry and bitter words come, they come from somewhere; there is a time and a place in the heart where the words are true. When they are spoken, they take on a life in the heart of the hearer as well as in the speaker, changing each. Grace and forgiveness are needed to grow past them. When the first son said no, he meant it. Later he thought better of it and his actions show he meant a yes. When the second son said yes, he meant it. Later he thought worse of it and his actions meant a no. Neither of these sons can take back their words. They can make good on them or they can turn away from the reality they created, living out their father’s request or letting it go unfulfilled. This parable gives me hope even as it confirms what I’ve believed about words: they count, and they can’t be unsaid. But I can think better of them and work to change the reality they created. And when I pay lip service without true service, even then, there is a place in my heart that holds the yes. With grace and forgiveness, I just may find it. The first son had no intention of doing what his father asked and said so without so much as an “excuse me,” or “sorry, no.” Some time later, he changed his mind and went into the vineyard to do the work his father asked of him. The second son was just the opposite – a positive reply with a deferential “sir” attached, the very image of respect and courtesy. Quickly, he turned away from making good on his pretty words and whatever work he might have accomplished evaporated into a fog of good intention. I’ve snapped a rude no to a task then later thought better of it; I’ve said an enthusiastic yes to a request and never followed through. Honest to God, I have. But the staggering truth Jesus shows me in this parable: there’s no such thing as good intentions that don’t lead to action. Sometimes circumstances interfere and I can’t follow through as quickly or directly as I had hoped. In rare cases, I never get out to the vineyard because something beyond my control makes it impossible. But most of the time, if I don’t act, then I didn’t really intend to do the work in the first place. I just hate to admit this to myself or reveal it to others. Yeast is a staple in my kitchen. Not the little packages found in the market’s baking goods aisle, but vacuum packed one pound bags purchased a few times a year and stored in the fridge after opening. On an average week, I use three tablespoons of it to make bread and at least a couple of teaspoons to make rolls or pizza dough. It has a distinct scent that’s hard to describe but instantly recognized by most people who’ve visited a bakery or bake themselves. Whether I start the yeast in warm water by itself or add it directly into a flour/water/salt mixture, it doesn’t take long to see its effects. The dough grows, expanding out and up, adding volume and lowering the density evenly throughout. Add some time and heat, and yeast turns a heavy lump of flour into a bagel, baguette, focaccia, or doughnut – the staff of life or a fancier version of it. Yeast plus yeast equals yeast; yeast plus flour equals something more than just those two things. Yeast isn’t really an addition in its own right: it’s a transforming element that infuses everything it touches, creating something light and sustaining, an everyday wonder of taste and texture. Is that what the kingdom of heaven is? Not something added to the end of life, but something that’s mixed into its very grain? The kingdom of heaven an everyday wonder, light and sustaining – am I so blind that I can’t see this in others and in myself? Prayer is always said before God and in the company of faithful seekers, and I welcome your company. It’s been a year and more words than I can count since this opening post. I still pray this prayer, and I still believe that prayer is always said before God and in the company of others. Thank you for being my companions in prayer and partners in seeking God’s presence. It’s been one long snowstorm in Massachusetts. In the past three weeks, the snow banks have grown into mountains and sidewalks are out of sight. It’s not that any one of the storms created havoc, but the steady onslaught of snow laden clouds that have covered the sun for weeks. Snow accumulation has accumulated: too much too close together. Not a single incident, but a collection of slights and plans gone awry that accumulated into paralyzing, insurmountable banks. A cry to God for help, for a place to stand, for a reprieve from something too big to overcome. Whoever wrote this psalm had too much too close together. 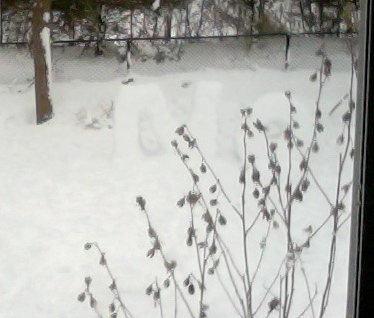 My sons built a snow NO a few days back. They’ve each had fun events cancelled and school days missed – life veering from its expected track. But they had a great time building the snow NO and spending time outdoors together. I see their NO every time I feed the birds or glance out the window. No amount of blinding white can hide the truth: we are never lost to God. Snow or no snow. As for me, I am poor and needy, but the Lord takes thought for me. You are my help and my deliverer; do not delay, O my God. What I see inside colors what I see outside. If my inner life is a wasteland of fear and anger, I’ll see enemies all around, dark projections that threaten to overwhelm me. Overtaken by my inner darkness, I am blind. Disheartened by the dangerous world, so very aware of my own inadequacies, there is no place for me to hide. When I rely on my own strength, intelligence, and courage, the world shrinks to the size of my own inner resources. There’s nothing beyond the end of my nose. In such a small place, there is no help. For I am ready to fall, and my pain is ever with me. (Ps. 38:17) There is no way to get myself out of the box I created. I need help, and so I cry to God: I confess my iniquity; I am sorry for my sin. (Ps. 38:18). Sin isn’t a tally of all my bad deeds and shortcomings, it’s an admission that I’ve lost my way in the darkness. I need someone else to bring me back into the light. Psalms bring together images that don’t usually travel in the same circles. In this case, God bringing desolation to the earth and God making wars cease. Melting earth and broken bow, both changing reality in unimaginable ways. Be Still and shattered spear, exaltation and burnt shields. God is with us, God is our refuge – the very God who guided Jacob from his trickster days to being Israel. What would this world look like if everyone called it even, dropped their deadly toys and went home? Diplomacy would be the only way to get things done. Peace takes a lot more work and time, friendly relations a lot more flexibility and respect. Everyone would have to play by the rules…eventually. In a way, I think that would be a desolation of the earth. A reversal of how power is exercised on a global scale destroys the violent reality that justifies and even encourages war. This isn’t just taking away the weapons: this is destroying the acceptance of pervasive violence as a way to live as a country, culture, and species. God is our refuge and strength,a very present help in trouble.